This article is a review of 20 CPAN modules that can be used to make HTTP requests. Many of the modules can handle FTP and other types of requests, but here I'm just focussing on HTTP, and in particular GET and POST requests. A sensible default choice would be HTTP::Tiny: it handles all requests types, supports SSL, transparently handles redirects, and has a relatively small number of dependencies. If you're working with cookies or need full access to the request and/or response, and top performance and minimal dependencies aren't requirements, then use LWP (or Mojo::UserAgent if you're already using Mojolicious). If speed is critical for you, then you have two choices: for pure perl, go with Furl. If you're happy to install libcurl (a C library), then go for one of the Curl-based modules. LWP::Curl has the simplest interface. 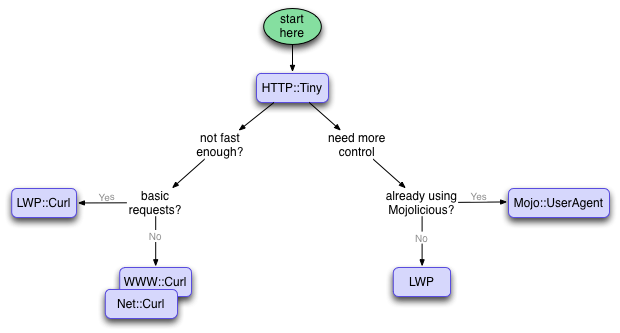 If you need speed and complete control, then look at WWW::Curl or Net::Curl. The following table lists the modules reviewed, along with basic information. The # users column is the number of distributions that list the module as a pre-requisite. I intentionally excluded modules like WWW::Mechanize, which provide higher-level functions. Web::Magic was close to failing that test! I'll look at each module in turn, then present results of comparing the modules, and finally which module you should use when. Does it provide a clean simple interface? Can you make https requests? Which HTTP verbs/methods are supported? If you want more control and information on the response, can you get it? (How) does it handle redirects? What dependencies does it have? I don't like to see modules that reinvent wheels just to minimise dependencies, but on the other hand if I'm relying on this module, I don't want half of CPAN pulled in. Can you specify the User-Agent string? If you're just writing a quick script making one-off HTTP requests, you'll probably be happy to go with the module's default. But if you're writing a module, or more involved application, you'll want to stamp your own identity. In each section I'll show SYNOPSIS style code examples to illustrate basic use of each module. Before starting the reviews, I'll present a simple model for making HTTP requests, so I can describe how each module fits into it. I'll assume you're familiar with the basics of HTTP, and how the web works (there are plenty of HTTP tutorials online). An HTTP request is the network request made to an HTTP server. It consists of the method (also referred to as the verb), such as GET, POST, HEAD, PUT or DELETE. The request contains a number of headers, and may contain a body. An HTTP response is what's returned by the HTTP server as a result of receiving a request. This contains a 3-digit HTTP status code, a reason phrase, a number of response header fields, and possibly a message body. A User Agent is the entity (for example, a web browser) which actually makes the HTTP request. The HTTP request should include a User-Agent header, which identifies the agent (browser, robot, etc). With some of the modules here, each of those entities is represented with a separate class. Sometimes the request is implicit, constructed from arguments passed to a request method on the User Agent. And sometimes there isn't a separate response class either: everything is rolled into the User Agent. Disclaimer: I'm not an HTTP expert. Please let me know if you spot any errors, inaccuracies or gaps in the material below. Furl bills itself as a lightning-fast URL fetcher. Not merely fast you understand, but lightning fast. I'm expecting that most of the time in making a request is in network latency, so I'm having a hard time seeing what will make this so much faster than the competition, but we'll see. Furl has a generic request method, but also provides get, post, head, put, and delete methods. Each of these return an instance of Furl::Response, which is very similar to the HTTP::Response class from LWP (and provides a method as_http_response() which will return an instance of HTTP::Response). Furl will automatically follow redirects, upto a specified limit, which defaults to 7. You can overide this with the max_redirects parameter passed to the constructor. If you don't want redirects followed, just set this to 0 (zero). Furl doesn't natively support working with cookies but the documentation contains a section which shows how to use LWP classes with Furl to handle cookies. This would lose you some of the performance benefits of Furl over LWP. Furl does support https requests. The get method is a bit strange: if the request results in an HTTP 200 status code, the content of the request page is returned. Otherwise it returns a status string, in the form "404 Not found". This means that anything other than a status code of 200 is considered a failure, and that redirects are not handled (you'll just get "302 Found", for example). This design means you can't tell the difference between a request for a non-existent file, and a text file which contains "404 Not found". Ok, not very likely, but this is exactly the sort of thing an HTTP library should get right. And it's why you should always check the status_message, rather than the return value of get. The module supports a number of methods for getting at header information returned in the HTTP response, but it doesn't let you get the HTTP status code and message individually, only via the status_message method. As noted above, HTTP::Client only supports making GET requests, doesn't support SSL, and doesn't handle cookies. The version on CPAN when I started working on this review had a number of bugs. I ended up getting co-maint and fixing the bugs listed on RT. I may improve some of the areas mentioned above, but more likely, unless I hear that people are actively using it, I'll just maintain it into retirement. The get_status() method returns two values: the status code and reason phrase, as defined by the HTTP spec. Though because it's low-level, you have a lot of control over the outbound request. It supports all the regular HTTP request types and some which are apparently for DAV (which I'm not familiar with). You can make POST requests, but you have to specify the Content-Type explicitly, and have to encode the body by hand as well. To encode the POST parameters properly, you need to do a lot more than I did, so if you need to POST, you should use a different module. You can also do async requests as well, where results are pulled back in chunks of N bytes. Doing timeouts is an exercise for the reader (hint: lookup select() in perlfunc). HTTP::GHTTP doesn't handle https requests, as the underlying libghttp doesn't handle SSL. There is no support for working with cookies, and it doesn't handle redirects for you. The underlying libghttp doesn't seem to be maintained: I couldn't find much about it online, and this module was last released in 2002. It has been superseded by libSoup for the GNOME project. So this is probably not one to use, though as you'll see in the performance comparison below, it's the fastest module, both for GET and POST requests. HTTP::Lite is a "lightweight HTTP implementation", intended for use where you're only wanting to make simple HTTP requests. The following code shows how to make a POST request. You call the prepare_post() method before making the request. This builds the request body, and sets the method type to POST. An instance of HTTP::Lite represents a user agent, an HTTP request, and the HTTP response, all at the same time. As a result the interface is potentially a little confusing, which is further not helped by the documentation contradicting itself in a number of places. The documentation says that HTTP::Lite only supports GET and POST requests, but also describes a method() method, which suggests you can do PUT and HEAD requests as well. I've only tested GET and POST. I've just taken over maintenance of this module and have fixed some of the outstanding bugs. I'll resolve the documentation issues and decide what to do on remaining bugs. The module has some features I've not covered, such as the ability to provide callback functions which are invoked at specific points in the request cycle. It doesn't: support https; handle redirects, or provide support for cookies. I wouldn't recommend using this module if you were starting something now. HTTP::MHTTP provides a low-level library for making HTTP requests, based on a C library which is included in the distribution. Instead of an OO interface like most modules here, it exports 14 functions which act on global variables held in the C library. So not thread-friendly. most web servers these days require 1.1. HTTP::MHTTP doesn't pass the Host: header ("Some support of HTTP 1.1 is available"), and if you don't pass it, your request will fail with most (all?) servers. But when running the benchmarks, I discovered that if you switch to HTTP/1.1 then you can't make multiple requests: the first request will succeed, but subsequent requests fail without even talking to the HTTP server. The following is the closest I could get to a working example of a POST request. The parameters are successfully posted, but the body returned has some extra characters. If you're going to make multiple HTTP requests, you have to call http_reset() between requests. This doesn't clear any headers you set though, so you might want to call http_init() between requests instead. The documentation says that "rudimentary SSL support can be compiled in", but I didn't test that, as by this point it was clear that you shouldn't use this module. Given the "rudimentary", I counted https as not being supported (for the features comparison table, below). It also doesn't handle redirect transparently, and doesn't help with cookies. This module marked a first for me: the first time I've given up on trying to get a module to work! When reviewing other modules I've fixed a fair few bugs, and worked hard to install underlying C libraries, but after spending a couple of hours on this, enough is enough, for the moment. HTTP::Soup is a Perl interface to libsoup, which is an HTTP client/server library for GNOME. It looks like libsoup replaced libghttp as the HTTP library for GNOME. I first tried installing libsoup by hand, but on the 9th dependent library, and struggling to get things building cleanly, I decide to give MacPorts a go. After nearly an hour I finally had libsoup installed: man, it installed a lot of packages! Then I tried to install HTTP::Soup. There was an undeclared pre-requisite, but once I got past that, I couldn't get one of the dependencies to install. I may go back to this, but for the moment you should probably give this a miss, unless you've already got all the GNOME libraries installed, in which case you might be more successful. HTTP::Tiny supports all HTTP verbs (GET, HEAD, PUT, POST, DELETE), either with the generic request method, or with convenience functions, which are the lower-case name of the verb. Note that if you make a request with the If-Modified-Since header, then a 304 response (the remote file hasn't been modified), then the success field in the response hashref will be false, so you'll need to check the status field. Https requests are supported if you have IO::Socket::SSL installed. When constructing the request, you can specify headers to include either by passing an instance of HTTP::Headers, or by passing an arrayref which contains key/value pairs. If you're doing anything other than the simplest requests, you might also want to look at HTTP::Request::Common, which provides convenience functions for constructing request objects. In addition to http requests, LWP supports ftp and file URLs, and can be used to POST to mailto URLs. If you want to make https requests, you 'just' need to install LWP::Protocol::https, which comes in a separate distribution. More examples on using LWP can be found in lwpcook. If headers is true, then the return value from get and post will include the HTTP headers from the response. If followlocation is true, then LWP::Curl will follow redirects, up to the number of hops specified in maxredirs. The followlocation is redundant, as you could just set maxredirs to 0, which is what HTTP::Tiny and others do. The style of interface falls between LWP and Net::HTTP::Tiny. It does support https, but you can't provide HTTP headers to include in the request, and it doesn't support cookies. I've submitted a number of fixes and changes to this module, which Lindolfo was very quick to act on, and he's given me co-maint. I may come back and do some more work on this, as I like the combination of a simple interface with Curl's performance. There is no way to get hold of the HTTP response code, but if you just want to get the contents, and just care about success or failure, then this might serve your needs. The getstore function takes a URL and filename; if a GET request to the URL is successful, the contents are written to the file. The function returns the HTTP status code from the response. The mirror function takes the same arguments, but as an If-Modified-Since header to the GET request, taking the modified time from the filename, if it exists. There is no function for making a POST request. Mojo::UserAgent is part of the Mojolicious web framework. When using Mojo::UserAgent, you're actually working with quite a large collection of classes — you have to get your head around quite a lot to use it, even at a basic level. For example, when you make a GET request, by calling the get() method, you're returned an instance of Mojo::Transaction::HTTP. The documentation for Mojo::Transaction::HTTP is quite light, because it inherits a lot from Mojo::Transaction. It turns out that Mojo::Transaction has a res() method that returns a Mojo::Message::Response object. Aha, you might be thinking, that's the sort of thing you were after. It may be that I'm not thinking "the mojo way" here, but I'm trying to map Mojo::UserAgent into my existing mental model. It will handle redirects, but you have to specify a positive value for max_redirects, as it defaults to zero (i.e. don't follow redirects). I've submitted an issue suggesting that the default should be something like 5 (five). I got a quick response to this, saying they might make the change for the next major version (4), but don't want to break things with the current major version. Mojo::UserAgent handles all HTTP methods, https, and supports cookies. It's part of a comprehensive collection of classes, very reminiscent of LWP. So much so I found myself wondering why they didn't just use LWP. There are a bunch of additional things in there I haven't looked at though, so I'm guessing there are reasons why. If you're already using Mojolicious, then this is a good choice. If you're not using Mojolicious, then I can't think of a good reason why you'd use this over one of the other choices. The example above shows how you configure it to follow redirects for up to 5 hops. This module clearly provides a lot of low-level features for controlling and getting feedback on the request cycle, but I didn't find the documentation very helpful. It relies on you understanding the underlying C library. For example, getinfo retrieves one of the many defined pieces of information, but the documentation doesn't list all of the supported values. The distribution includes a number of examples in Net::Curl::examples, but I didn't find them particularly helpful either. The following shows a POST request. This took me a while to work out, though now when I look at it I wonder why. The documentation for Net::Curl says nothing about this, but when I hit a similar issue with WWW::Curl I spent some time looking at libcurl to work out the issue. See section on WWW::Curl below for the solution. I initially failed to install Net::Curl. CPAN complained that Net::Curl depended on ExtUtils::PkgConfig, which it couldn't install because pkg-config wasn't available. I tried to install pkg-config, but configure complained that it needed glib, and when trying to install glib, configure bombed out complaining that pkg-config wasn't found. The README explained that you could configure for curl manually, so I tried that. After searching online, I discovered that this was down to curl being compiled against the wrong version of openssl. My mac comes with curl, but I had compiled the most recent curl and installed it in /usr/local. I rebuilt curl and pulled in the right version of openssl, then manually configured Makefile.PL to pull in my version of curl and not the default system one. Successful install at last! Overall, this module appears comprehensive and stable. If you need fast requests or if you're already familiar with libcurl, then this might be a good choice. For interal use I might consider this module, but I were releasing a module to CPAN I wouldn't want to introduce a dependency on a C library. When using the getinfo method, you can either pass string names, or you can import the constants from Net::Curl::Easy. I think Net::Curl::Simple should provide these constants for you. Attempt to free unreferenced scalar: SV 0x7fc139909528 during global destruction. In addition to GET, the module also supports HEAD, POST and PUT. If your libcurl was compiled with the right options, then Net::Curl::Easy supports IPv6 and SSL. You can get at most (all?) of the full power of Curl, so this module does effectively support cookies, though the documentation doesn't mention how you do this. Which seemed to satisfy Net::Curl::Simple. Net::HTTP is a low-level module which represents an HTTP connection — it's a subclass of IO::Socket::INET. On top of the IO::Socket methods, it provides a number of HTTP-specific methods. Given the low-level nature you can achieve most things you might want to, but you will write a lot more code than with other modules. Given the low-level design, Net::HTTP doesn't support cookies, doesn't transparently handle redirects, and doesn't handle https. I'm not going to go into further detail. If you need complete control over your HTTP requests, this might be the module for you (LWP builds on it, amongst others), but for most people I suspect it's just too low-level. Net::HTTP::Tiny is a new module that bills itself as a "minimal HTTP client". It provides a single function for making GET requests, which returns the body on success, and dies on failure. (yes, I know that a blanket retry on 5xx is a bad idea). This really is a minimalist module. It will follow redirects up to a hard-coded limit of 5 hops, and will support IPv6 if IO::Socket::IP is installed. But that's about it. From email with Zefram, he's considering https support and a means for configuring the number of redirect hops, but is waiting to see what is wanted by users. I'd considering switching to this for some of my modules if it supported https. I think the module is mis-named: Net::HTTP::Tiny suggests it is related to Net::HTTP, so for doing low-level HTTP requests. By analogy with HTTP::Tiny and other ::Tiny modules, I think HTTP::Minimal would be a better name. One of the benefits of this module is the minimal number of dependencies. If you're writing a module which just needs to make a simple GET request, and want to minimise your dependencies (either for ease of distribution or to keep footprint and runtime down), then this might be a good choice. By default, if successful it will return an URI::Fetch::Response, and undef if the underlying GET request returned anything other than a 200 status code. You can change this behaviour with the ForceResponse option, which says that a Response object should always be returned. One of the things which sets this module apart from most of the others here is the support for caching. When fetching a URL, you can pass a cache object, which has to support the Cache interface. If the remote file is already in the cache, then fetch will add an If-Modified-Since header. If the remote resource has been modified since the cache was last updated, fetch will get a 200 response, store the contents in the cache, and return a 200 response to you, along with the contents. If the remote resource hasn't been modified, fetch will receieve a 304 response. On receiving a 304, fetch will get the contents from the cache, and return a 304 to you along with the contents (usually a 304 doesn't have a body). Given the nature of the module, I think that in this situation is_success should return true, and have submitted feedback to that effect. You can add the NoNetwork option to further control whether the remote resource is even requested. If set to 0, then fetch() works as described above. If set to 1, then the remote server isn't contacted; if it's in the cache you'll get it. A value of N (greater than 1) tells fetch() not to make the HTTP request if the cache was updated within the last N seconds. This module handles https and redirects, but doesn't handle anything other than GET requests, and doesn't provide support for cookies. There are a few more options that I haven't mentioned, see the documentation for more on those. This module should really be called URL::Fetch rather than URI::Fetch (there are plenty of resources online about the difference between a URI and a URL). Under the hood this is using LWP, so it will handle redirects and https, but you can't get at the HTTP status code, or the resulting URL if your original URL was redirected. The whole point of trying a number of alternatives is that you don't care which one succeeds, you just want the contents. This would request $url1, $url2 and assuming that was successful, wouldn't request $url3, and finally would request $url4, and return the result from grab_single() on $url4. I don't really see the scenario where you'd want grab_mirrorlist(). This feels like the rough-cut of a useful module that hasn't been finished yet. In the synopsis the author appears to apologise for the quirky interface, saying that it can't be changed now. I'd clean up the interface with new method names, and support the old interface (but deprecated) for backwards compatibility. URL::Grab handles https and redirects, but doesn't provide support for cookies, or for any HTTP method other than GET. All of which is in line with the design of the module. WM doesn't make the request from the constructor, but delays until it has to: in the above that's when you try and access the content. This means you can call a number of methods between the constructor and content(), to configure the request. To set headers on the HTTP request you can either call set_request_header(), or call a method named after the header, with underscores instead of dashes. In general, you don't need to worry about when the request is made, but you can call do_request() explicitly, should you want to. Web::Magic handles redirects and https, and can handle cookies (it uses LWP, and you can pass your own instance of LWP::UserAgent with the user_agent method). There are lots of post-request methods, and this is where Web::Magic stands apart from the other modules. The request itself is made with LWP, and you can use the response() method to get the HTTP::Response method returned by LWP. The to_dom method parses the response body as XML or HTML, based on the Content-Type response header, and returns the result as an XML::LibXML::Document. You can get the response body as JSON or YAML, or RDF::Trine::Model, whatever that is. It also does plenty more besides. This depends on a lot of modules: installing Web::Magic seemed to take a long time. Furthermore, it uses them all at compile time, where many of them could be loaded only if needed. It's a strange beast: personally I'm not a fan of the kitchen sink school of module design, but if you want to process a remote file as RDF, or one of the other high-level operations it supports, then this module might be just the thing for you. You call methods to configure a request you want to make, then call perform() to actually make the request. The documentation for this module is fairly thin - it refers you to the curl documentation online. The documentation also suggests that you use LWP for most situations where you're working with HTTP, but that WWW::Curl may be a better choice where speed is important, or where you want to make multiple requests in parallel. WWW::Curl::Multi will perform multiple requests in parallel, in a non-blocking mode. WWW::Curl::Share is used to share DNS and cookies caches between multiple instances of WWW::Curl::Easy. The get and post methods return an HTTP::Response object (which used to be part of the LWP distribution, but is now part of the HTTP-Message distribution. WWW::Curl::Simple doesn't follow redirects and can't handle https requests. I've submitted a patch to addres both points. It can't handle cookies, because you can't get at the underlying Curl handle in order to pass the appropriate options. The other way you can use this module is to make multiple requests in parallel. This is built on top of WWW::Curl::Multi. While this undoubtedly provides a simple API to Curl, it is much slower than the other Curl-based modules (see the performance comparison below). The following table summarises the capabilities of each module. The following shows the results of benchmarking the modules for making GET requests. I ran two separate benchmarks: one for a very small file (14 bytes), and another for a much larger file (100K). I made 10,000 requests for both benchmarks. I was surprised to see WWW::Curl::Simple performing so badly, given it's based on libcurl. I'd put onto my list to look into that, but having looked at dependencies (see next section), I suspect that Moose is the culprit. At some point I'll see whether switching to Mouse would help things. I also need to look into why HTTP::Client degrades so badly with larger files, given most of the work is done by HTTP::Lite, which doesn't suffer in the same way. The following shows the results of benchmarking the relevant modules for making simple POST requests. This was basically the example POST request showed for each module above; Again, I was making 10,000 requests for each module. A shame that the fastest module (HTTP::GHTTP) is no longer maintained. If you're writing your own module which is making HTTP requests, then it may be important to you how many dependencies the HTTP request has. This may be for performance reasons, or to minimise the likelihood of your module not installing / working due to downstream dependencies. The -1 is because the module itself appears in %INC as well. I was expecting Web::Magic to come in last, but was surprised to see WWW::Curl::Simple close on its tail. WWW::Curl::Simple uses Moose, which adds 111 to the tally right off the bat. The top four depend on external C libraries, as do all of the Curl-based modules. While thinking about dependencies, I got distracted looking at modules for collecting dependency information. For the first update to this review I'll probably distinguish between core and non-core dependencies, and the number of dependent distributions as well. There's no single module which will be the best to use in all situations. I started writing this section in the format "If you want X and don't care about Y, then use Foo", and quickly realised a graphic would be easier and clearer. In this context, "basic requests" means GET or POST requests, https and transparent handling of redirects. A final twist: if you're repeatedly requesting the same file, for example in a regularly schedule job, then you might want to consider URI::Fetch. Does anyone know of a lightweight module that provides such a function? If not I'll suggest to Gisle that LWP's code be pulled into a separate dist. 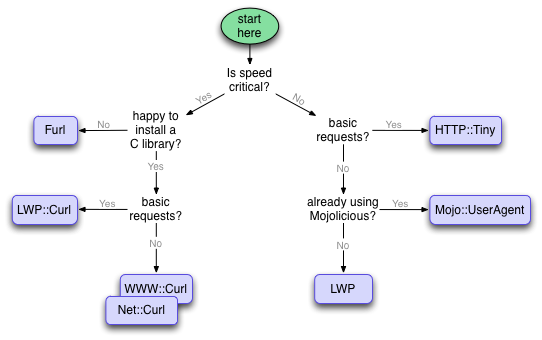 WWW::Curl and Net::Curl are almost identical in basic usage, though WWW::Curl provides a lot of other features. I wonder if these could be merged into a single dist? When I started work on this review, I found most of the Curl modules (apart from LWP::Curl) quite frustrating to work with, as they assume you're familiar with libcurl. I wasn't. Now I'm a lot more familiar with Curl, and am happy to work with any of the modules. Perhaps one of the benefits of merging WWW::Curl and Net::Curl would be to provide more comprehensive documentation.